This article was sent to us the other day and we just had to share it. Does anyone else remember these fun little pedal cars from their childhood? The Little Tikes toy car has long been a fond childhood memory for Brits everywhere — but what if you could actually drive one on proper, grown-up roads? Well the thing is, you might now be able to. 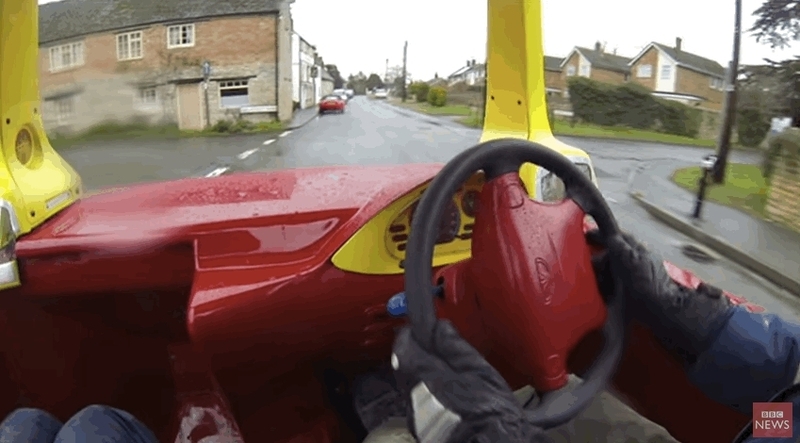 Mechanic John Bitmead and his brother Geoff of Attitude Autos made a real life, road legal version of the classic children’s toy back in November 2013 — and now they’ve put their creation up for sale on eBay. Here’s a flash back to early 2014, when the car first became famous. Here’s a slightly dizzying shot from behind the wheel. The car doesn’t look like it provides much rain protection, but it sure does look cool. “We have covered over 5,000 miles in the past two years driving around shows and charity events in the UK,” reads the item description, “and apart from it not being the fastest car on the planet has been the most incredible fun with people queuing up to take photos along dual carriageways and highways on every trip. If you do happen to have a road going version of a little tikes toy car we would love to take a look at our cash for cars office in Dublin. Not too sure how to calculate the market value on this one but should have a lot of fun trying to figure it out. The post This Little Tikes toy car will put a smile on your face appeared first on CashForCarsIreland.com - Dublin.